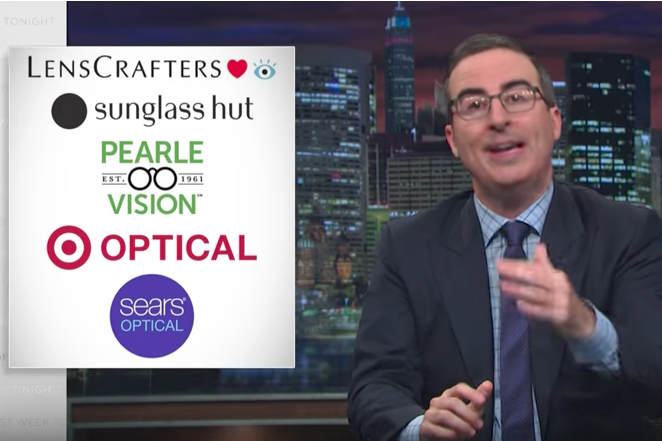 I don’t know if you’ve ever seen John Oliver’s - Last Week Tonight on HBO, but a few weeks ago, John spent 15 minutes digging into the causes and effects of big corporate mergers. Big businesses getting even bigger, and what that looks like for the consumer. John focused much of the segment talking about corporate giants we’re all familiar with including Delta Airlines, Google, Walmart, and AT&T, but he then highlighted a corporate colossus you may not have heard of, but which hits very close to home for all of us at Berlin Optical Expressions, the Italian company Luxottica. Luxottica, it turns out, not only owns many retail outlets you’re certainly familiar with including LensCrafters, Pearle Vision, Sears Optical, Target Optical, and Sunglass Hut, to name a few; but it also owns the eyewear fashion brands Chanel, Dolce & Gabbana, Polo Ralph Lauren, Prada, Ray-Ban, and many more. Most of us would consider those brands pretty big fish on their own, but when Luxottica came along, the pond suddenly got much, much bigger, and these brands were swallowed up whole. We see corporate consolidation happening all around us all the time, and while we’re not always paying attention to the consequences, there is a homogenization of service, a detachment, and a leveraging of cost that affects us in the marketplace every day. We should say right up front, there are tons of really great people working at all of those retail outlets, and behind the scenes of each of the brands that Luxottica owns, but ultimately, they’re not the ones deciding how to serve their communities, there’s a board of directors and a host of stockholders whose bottom-line is considered first. As you might imagine, Berlin Optical Expressions has a different set of considerations. Our doctors, opticians, office managers, and staff are all part of, and connected to, our Central Vermont community. By being locally owned and operated, Berlin Optical Expressions has the flexibility and the incentive to respond directly to the needs of our clients and our shared community. We do carry many Luxottica brands in our showroom including Dolce & Gabbana, Prada, Ray-Ban, and Oakley (watch the segment to find out how Luxottica acquired Oakley), but we also carry brands you won’t find in a Luxottica outlet like Vuarnet, Smith, Costa, and Kaenon. Not only that, but we’re not beholden to a stockholder bottom-line, we’re committed to our community. Berlin Optical Expressions is proud to be a part of the Central Vermont cultural, environmental, business, and recreational community, and we're constantly looking for ways to give back to a community that gives us so much. We rely on you and your patronage to keep us going, as much as you rely on us to keep your eyes healthy, your eyewear up to your expectations, and to helping you and your family realize the best vision possible, so thank you for your commitment to local eye care. Keep it local at Berlin Optical Expressions – Come by and see us Today!